1868. 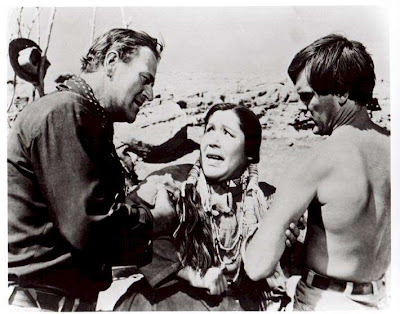 Ethan Edwards (John Wayne) and Martin Pawley (Jeffrey Hunter) continue their hunt for Debbie Edwards (Lana Wood), the only survivor of a Comanche "murder raid" that saw the Texas homestead of Ethan's brother razed to the ground and the family brutally butchered. The pair form an uneasy alliance in their five-year pursuit of the abducted girl through sun and snow - one a deeply frustrated ex-Confederate soldier with a nasty racist streak and the other an eighth-blood Cherokee adopted by the Edwards clan - but are united by their shared obsession with bringing Debbie home. John Ford's emotional Western, probably his finest achievement, was a big favourite with the New Hollywood auteurs of the seventies and eighties - notably Martin Scorsese, who used its narrative structure to shape Taxi Driver (1976), George Lucas, who lifted whole shots for Star Wars (1977) and Alex Cox, who named an oddball "microfeature" Searchers 2.0 in 2007. 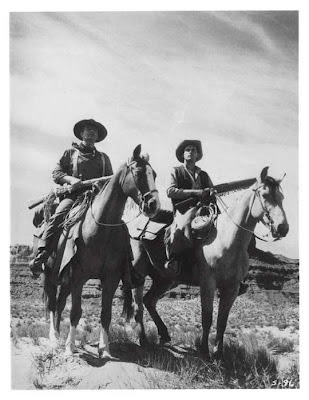 Ford certainly never bettered this portrait of the volatility of the Old West - there are few settlements in his barren, clay red Monument Valley, no pastures for grazing, less water and no law to speak of other than the boisterous Reverend Clayton (Ward Bond) and the occasional passing cavalry troop. Its isolated farms and ranches could fall at any moment to an onslaught from warring Indians, the settlers powerless to resist. Film critic Frank S. Nugent adapted the 1954 source novel by Alan Le May and is careful to apportion the blame for this tenuous state of affairs evenly, with both the army and the Native Americans responsible for massacres and Ethan Edwards the only character seen to carry out a scalping. Edwards is a loner knotted up with bile and hatred, disinclined to surrender with the South and disenfranchised from civilisation ever since. His gouging out the eyes of an Indian brave already buried ("Ain't got no eyes, he can't enter the spirit land - has to wander forever between the winds") is utterly obscene because it is both a transgressive violation and spitefully premeditated, designed to cause the gravest offence. Ethan himself is blinded by anger and a lust for revenge and his disgust at the idea of the older Debbie (Natalie Wood) being made a Comanche squaw is clearly sexual and so great that he sets out to kill her when he learns the truth before finally relenting at the close. This fuels Freudian interpretations of the film that read Scar (Henry Brandon), the proud war chief who captured her, killed her parents and brother and raped her sister, as an eerie doppelgänger to Ethan, living out the plainsman's darkest and most savage subconscious desires. However, Ethan is humanised and partly redeemed by his loyal friendships with the likes of Mose Harper (Hank Worden), a rocking chair-fixated simpleton, and his unspoken, unrequited love for Martha (Dorothy Jordan), his sister-in-law, which is subtly conveyed by Ford. Martha appears to have married Aaron Edwards (Walter Coy) as a matter of pragmatism, growing tired of waiting for Ethan, a relationship echoed in the more comic love triangle between Martin, the fiery Laurie Jorgensen (Vera Miles) and goofy guitar-strummer Charlie McCorry (Ken Curtis). Martin risks inheriting Ethan's alienation if he doesn't do right by Laurie, a fate to be avoided at all costs. When the door famously closes on Ethan Edwards at the film's close, he is left alone again, presumably now doomed himself "to wander forever between the winds". His departure brings down the curtain on John Wayne's finest performance. More than just a conservative icon of the genre, Wayne could really do it when it counted. Witness the torment on his face when Brad Jorgensen (Harry Carey Jr) asks what really happened to Lucy (Pippa Scott): "What do you want me to do? Draw you a picture? Spell it out? Don't ever ask me! Long as you live, don't ever ask me more..." The scene in which he drunkenly burns down the ranch house he's been building for Vera Miles after realising she's in love with Jimmy Stewart's educated young lawyer instead in The Man Who Shot Liberty Valance (1962) is another good example of the actor on top form. Worden and Curtis also give highly memorable character turns here and there's strong support from seasoned hands like Bond, Miles, John Qualen and, indeed, cinematographer Winton Hoch, unafraid to use bold primary colours to bring the West to unreal life through bloody sunsets, blue shadows and crystal rivers. With the exception of the unfortunate treatment of Look (Beulah Archuletta), the Indians are sensitively handled and the cavalry are much less sentimentalised than they were in Ford's earlier tribute pictures like She Wore A Yellow Ribbon (1949). 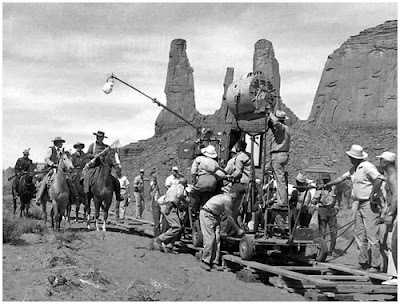 The Searchers is without question a masterpiece, its themes as timeless and universal as they come, its execution unrivalled if perhaps not altogether faultless.